This new live/work development is an example of “Missing Middle” housing: a means to add density between single family and the huge apartment complexes. Twelve rental residences total occupy the 90-foot by 125-foot site. There are six 3-bedroom, 2.5-bath townhomes. The insulated ground level spaces can be used for garages or studio/workshop/office space. The first floors are all open floor plans with kitchen islands, and the bedrooms are upstairs. 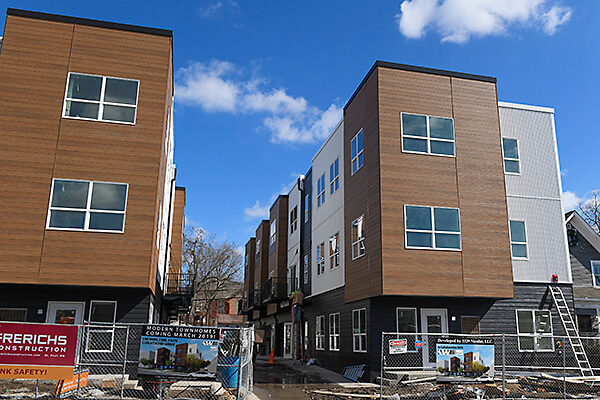 A building of six traditional apartments sits right on the Nicollet Avenue corridor, four with two bedrooms and a bath, two with one bedroom and a bath. This home was purchased and constructed through the Minneapolis Homes: Build or Rehab program (www.minneapolishomes.org) offered by the City of Minneapolis.